High above the confluence of the Spiti and Pin Rivers, located Dhankar at an towering altitude of 3894 mtr. 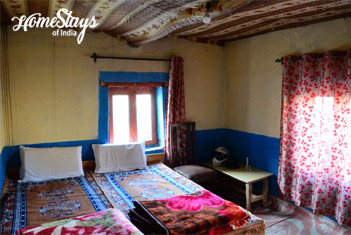 An 8 km drive up from Sichling on the Kaza–Tabo road will take you to this oldest village and ancient capital of the Nono kings. 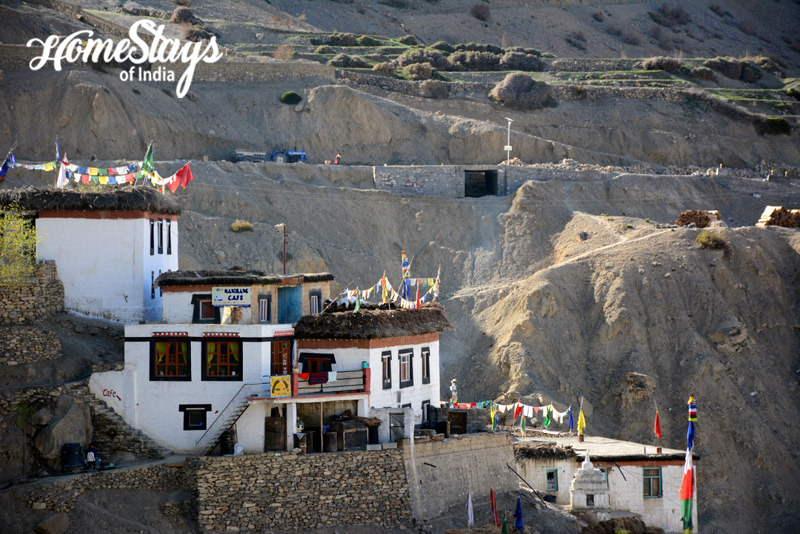 Situated dramatically on a hillock, Dhankar Monastery is one of the most spectacular sights in Spiti. 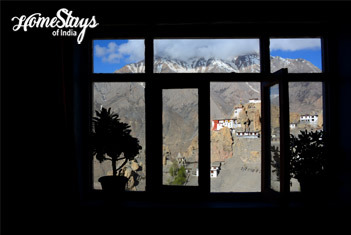 The home is located right in front of Dhankar Gompa, almost at eye level. 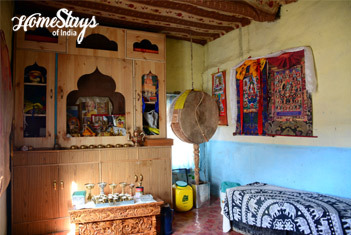 Built in a tradition Spitian style with a prayer hall for meditation and yoga, it has total 3 rooms for guests. One is a hall with low floor setting, big enough for 6 people, second is three bedded and another is double bedded. You can join the family in traditional dinning room to eat or just to chat. Cafeteria is certainly a highlight of the home. Its a nicely done place, good enough for 15 people to enjoy your food. You mostly hear Tibatan or trans music here but can feel free to play your own. The home is open to super adventurous people in freezing winter also. 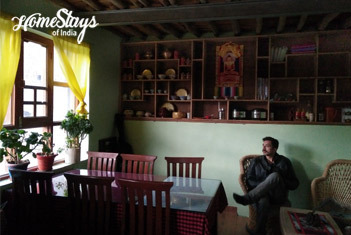 Anil, a Gelupka Buddhist is a young, very soft spoken mountain lover and an experienced trekking guide. He is an educated guy and speaks fluent English. He also is diploma holder in Painting, Art & Craft. Otherwise he is a farmer. Food is a serious affair here. Breakfast can be Tibatan bread with Jam, butter n honey. Parantha with milk tea is everyone’s favorite. You may ask for Tandoori Parantha also with hot tea. Daal, Roti, Rice and mix veg. is a staple food. Italian, Chinese, Tibatan, Israeli, Continental food and milk shakes can be ordered separately in cafe. Best of tea like, Ginger lemon honey tea, Green tea or Masala tea is available any time. • Trek to Dhankar Lake (2.5 km). Its a steep trek where you go from 3894 m to 4270 m in just hours. • Manirang Expedition 3 days to reach base camp and 1 day to come back. Its a twin peak, North (6593 m) and South (5550 m) Manerang. You have to drive to Mane village to start trek.